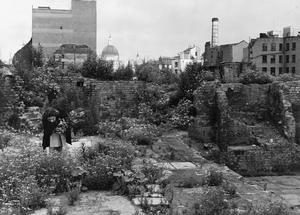 In the shadow of St. Paul's Cathedral, many blitzed sites are now profuse with wild flowers. TWO MEN TAKING NOTES FOR CONSERVATION PURPOSES IN A FIELD OF WILD FLOWERS IN CYPRUS (CIRCA 1950s). A FIELD OF WILD FLOWERS IN CYPRUS (CIRCA 1950s).